A new national project has put a face to Canada’s veterans of the World Wars – and brought those faces to Canadian streets. The Gregg Centre for the Study of War and Society at the University of New Brunswick received a contribution from the federal government last year to commemorate the World Wars through their Commemorate Canada Program. A portion of that funding was to develop street light banners recognizing our Victoria Cross recipients from the First and Second World Wars and to install them in Canada’s capital cities. Each banner displays a recipient of the Victoria Cross from one of the ten provinces. A banner highlighting remembrance and thanks was developed for the three territories, where there were no recipients. The Victoria Cross is the highest military honour of the British Empire and now the Commonwealth, and is awarded for extraordinary valour and devotion to duty while facing a hostile force. Queen Victoria presented the first Victoria Cross on June 26, 1857. There are 89 Canadian recipients of the Victoria Cross from the World Wars: 73 from the First World War and 16 from the Second World War. The banners will be on display for various periods between now and 2020, when the present commemorative period for the World Wars in Canada ends. The project also highlights all 89 Canadian recipients of the Victoria Cross during the First and Second World Wars. 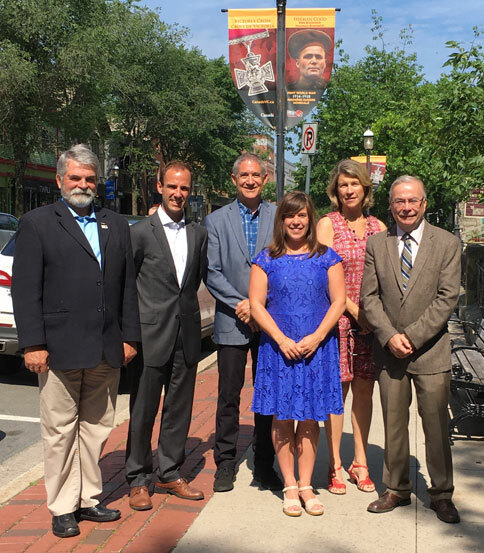 A ceremony held today in Fredericton marked the culmination of the project and highlighted the successful partnership with capital cities across Canada, and an increased awareness about this significant period in Canada’s history. "As we look to Canada's 150th birthday in 2017, we must never forget the brave contributions and sacrifice of our women and men who served Canada in the First and Second World Wars," said Matt DeCourcey, Member of Parliament for Fredericton. "We honour their service and the role they played in helping ensure our liberty and freedom, and recommit each and every day to building a Canada worthy of them."